Like many other Hindu festivals, Holi is celebrated as a national festival in Nepal, and almost everyone celebrates it, no matter what their religion is. Holi, also known as the “Color Festival”, is one of the most important festivals of Hindus and the India People walk in their communities to celebrate Holi, exchange colours and spray coloured water. A popular activity is to throw water balloon at each other, called Lola. On this day, people will prepare special foods and drinks to rejuvenate with friends and family. Holi also welcomes winter and summer with true family happiness. It is believed that in this festival, the combination of different colours can take away all the sorrows, make the life itself more colourful, and at the same time let friends and family forget all the jealousy and anxiety. It is best to wear white clothes during the Holi Festival. On these clothes, you can clearly see all the coloured powders, you can’t wash the ink, so don’t wear any expensive clothes, it is recommended to buy some cheap white clothes from the local market. Wear sunglasses so you can protect your eyes from powder splashes on your face. This powder will hurt your eyes. It is possible that the powder mixes the real paint and will stick to the hair all the time, all the wonderful colours in your hair lasts for a few weeks. Unless you like pink, green or blue hair, it’s best to be prepared to protect your hair. For example, you can wear a hat or headscarf to protect your hair. 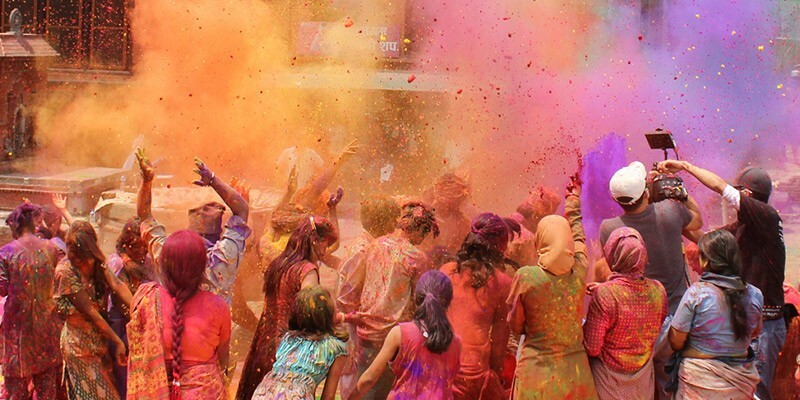 It’s great to take some photos during the Holi festival, but be prepared for your camera! Seal the camera body with a zipper bag and tape. Make sure these colourful powders and water don’t cause fatal damage to your camera or phone. Personally, I don’t recommend carrying a phone or any other valuables with you unless it’s GoPro. During the Holi festival, many squares or fields will organize special events. Ask your travel company or hotel staff or local friends for the best place to go. Usually, the powder will be scattered on your face and mouth. Masks can help you avoid absorbing bright colours of powder, and most importantly, it will ensure that your face will not be covered by the waterproof coating, making you look like a clown next month. The water balloon thrown by Nepalese children is sometimes really hurting. Get ready to find some bruises on you the next day. Since the beginning of the week before the Holi Festival in Nepal, you will be the target of splashing water for a whole week. In the first four days of the Holi Festival, you may get a lot of water balloon while walking on the street or at tourist attractions. Even if you will be splashed with water for a whole week, or paint colouring, just enjoy the Holi Festival and don’t be angry with the locals. Celebrating this magical tradition is your own choice, and sometimes those annoying water balloon may hurt you. I wish you a happy time at the Holi Festival in Nepal. I hope these tips will prepare you for a rare surprise in this life! Hiranyakashipu was a king in ancient India who was like a demon. He wanted to take revenge for the death of his younger brother who was killed by Lord Vishnu. So to gain power, the king prayed for years. He was finally granted a boon. But with this Hiranyakashipu started considering himself God and asked his people to worship him like God. The cruel king has a young son named Prahalad, who was a great devotee of Lord Vishnu. Prahalad had never obeyed his father’s order and kept on worshiping Lord Vishnu. The King was so hard hearted and decided to kill his own son, because he refused to worship him. He asked his sister ‘Holika’, who was immune to fire, to sit on a pyre of fire with Prahalad in her lap. Their plan was to burn Prahalad. But their plan did not go through as Prahalad who was reciting the name of Lord Vishnu throughout was safe, but Holika got burnt to ashes. The defeat of Holika signifies the burning of all that is bad. After this, Lord Vishnu killed Hiranyakashipu. But it is actually the death of Holika that is associated with Holi.